USEFUL IN INDUSTRIAL AND COMMERCIAL APPLICATIONS FOR GENERATION OF THERMAL ENERGY BETWEEN 90-260 ° C.
Our solar concentration technology is superior to what is currently available in the market for water heating, steam generation or heat input, having higher efficiencies compared to other types of solar collectors. 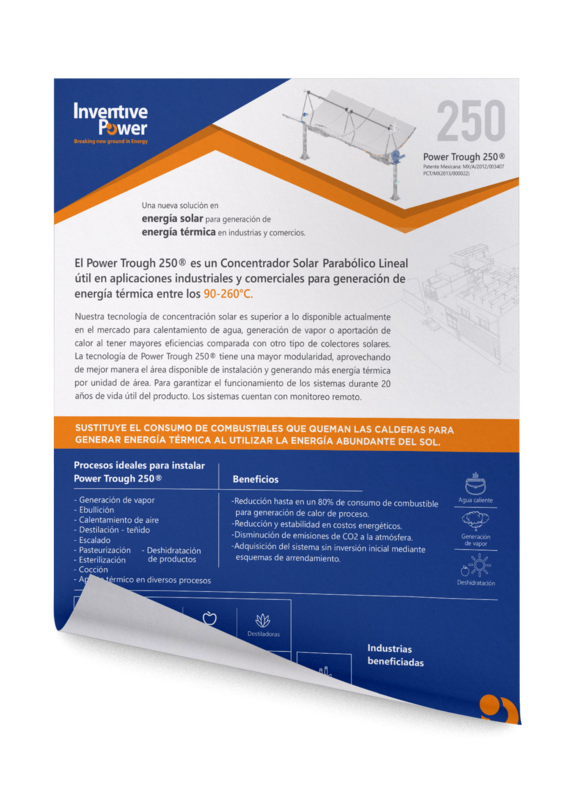 The Power Trough 250® technology has a greater modularity, taking better advantage of the available installation area and generating more thermal energy per unit area. To guarantee the operation of the systems during 20 years of useful life of the product. The systems have remote monitoring. 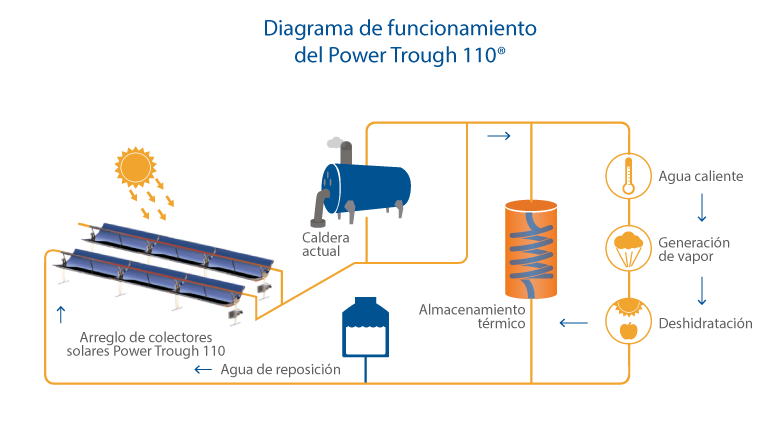 The Power Trough 110® consists of a highly reflective surface in the form of a channel that directs all the rays of the sun that affect it to a receiver tube, through which a liquid flows which absorbs all the energy collected. 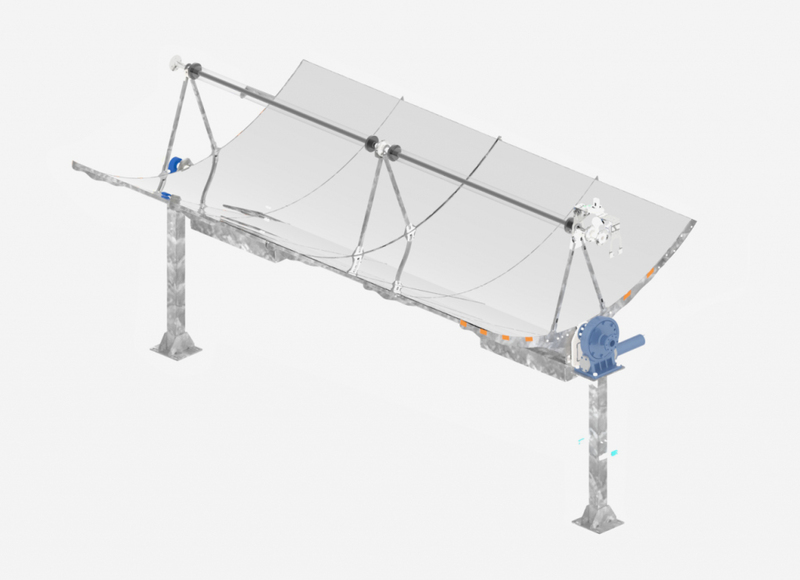 The system is modular, allowing to couple up to 10 concentrators in series and to connect several rows to increase the solar uptake. The system must follow the sun to reduce its angle of incidence with respect to it by means of an autonomous solar tracking system, Power Tracker Pro®. This Tracking System allows you to follow the sun during the day taking advantage of the maximum available solar radiation and returning the system to a shelter position during the night. In addition, provide security features to the system during high winds, storms and overheating of equipment.